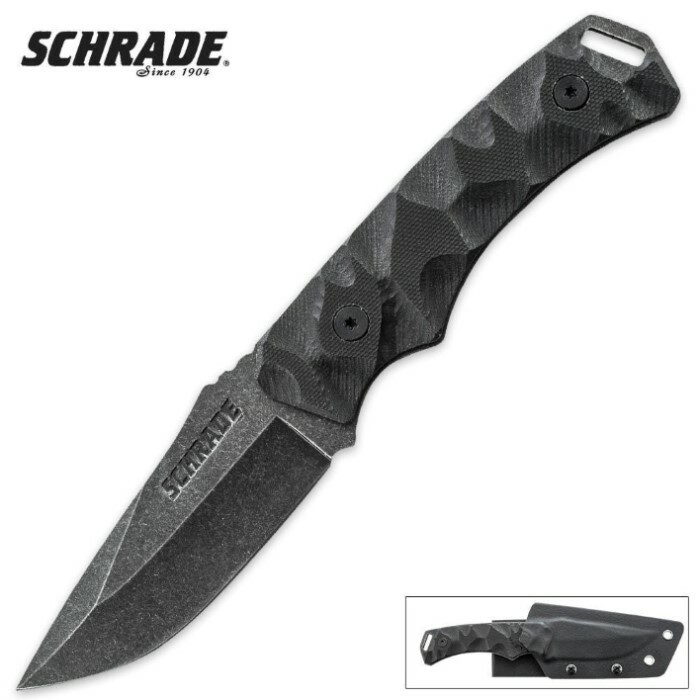 Schrade Tactical Fixed Blade BLK Stone Wash Finish | BUDK.com - Knives & Swords At The Lowest Prices! This Schrade Tactical Fixed Blade knife features an all-over stone wash finish. What's not to like about this knife? Awesome look, solid handle, tough steel and a really good Kydex sheath. Though some might prefer a larger blade, I feel this is about the perfect size -- large enough for some bushcraft work and still small enough for EDC. And the price is really nice, too. Highly recommended. Very good little knife. Was sharp enough to shave strait out of the box. Handle is a bit small for large hands. Retention on the sheath is okay but the knife does fall out if you jiggle it upside down a bit. Overall the knife is worth every penny of what I paid and will make its way into my camp bag. Really nice, well made tac knife ... not large, but adequate to say the least... mine was sharp enough to shave arm hair with no problem.Really like the kydex sheath for adjustable carry ,and locks the knife in well!...bravo Schrade!!! Five stars for five good reasons to buy this knife. 1. The blade is high carbon stainless steel, so it's both super strong and rust resistant. 2. The full-tang design and ergonomic handle give you sturdy comfortable control from either a front or back grip. 3. A stonewashed finish and rugged G-10 handle scales ensure a great looking blade even after extreme abuse. 4. The adjustable kydex sheath can be attached to any strap or belt in any draw position. 5. So many high quality features in one knife UNDER $50. Schrade's new knives are awesome, worth as much as Cold Steel or TOPS knives, and they're affordable. This little tactical pack knife is by far my new favorite. lies. i dont know what the guy below me was talking about but when i got this knife it came really sharp so i dont know if he got a bad one or i got a good one but it was sharp. I was back and forth about the knife initially as I've never owned a Schrade blade before, but I decided I should diversify my portfolio (:P) and go with it. Out of the box, I was EXTREMELY disappointed with the edge. It was very dull and hand sharpening with a whet stone was definitely out of the question. I ended up taking it to a professional sharpener (Travis Nagatani), and we got the blade as good as it could get. The blade is now nice and crisp and it cuts well. Over-all, the construction of the knife itself is good; the stone wash finish definitely looks cool and it fits nicely in my hand. The sheath itself is secure and dependable. The knife won't come out prematurely. It has little to no wiggle room. Overall, I wouldn't recommend it to a friend because it definitely requires sharpening, and sharpening by hand won't do the trick. This blade has left a sour taste in my mouth for Schrade's out of the box sharpening. I'm not too sure I will be getting another Schrade in the future. If I had the option to, I would rate it 2.5 stars because it definitely wasn't terrible, but there are other fixies in the same price range that come nice and sharp out of the box.